Why is PVC Decking an Upgrade from my Wood Deck? You Are Here: Home / Benefits of PVC Decking / Deck Installation / Dock Supplies / HDPE Decking / PVC Decking / PVC Decking Prices / What is the best material for my deck? / Why is PVC Decking an Upgrade from my Wood Deck? When you go out on your deck do you constantly have to worry about burning the bottom of your feet because your deck is scolding hot? With PVC decking, you’ll no longer have to worry about burning the bottom of your feet. PVC decking is made from 100% PVC plastic and is naturally cool. In addition to being cool, PVC decks are also splinter proof so you don’t have to worry about getting those painful splinters on the bottom of your feet. Wood decks are subject to both of these issues, and if you’re tired of splinters and burning the bottom of your feet, PVC decking is the right choice for you. Probably the biggest perk of PVC decking over wood decks is that PVC decking requires little to no maintenance unlike wood decks. Wood decks will begin to fade and paint can chip over time, but with PVC decks those worries will be a thing of the past. PVC decking is both UV and fade resistant and doesn’t require any time consuming upkeep. PVC plastic is one of the best materials for decks and it’s obvious the reasons why PVC decking is becoming more and more popular today. 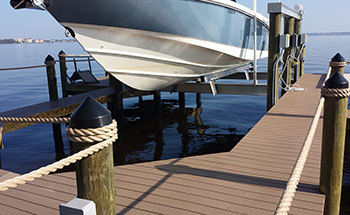 PVC decking is also slip resistant, making it much safer for you and your family than traditional wood decks. When wood decks become wet they can become very slippery and dangerous to walk on, and many have been injured falling on their wood deck. PVC decking is slip resistant making it very safe for you and your family even when wet. The reason why wood decks are now becoming a thing of the past are obvious. PVC decking is much safer, cleaner, and easy to take care of than wood decks. If you’ve been considering getting a new deck, a brand new PVC deck is the way to go. Our professionals at Keys Deck & Dock Supply can custom design the perfect new deck for your home. Call us today to get started on getting a new deck installed and instantly improve the look of your backyard.